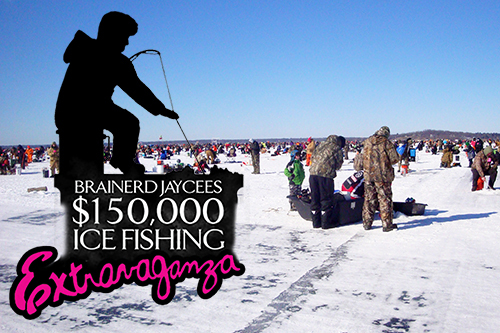 Mark your calendars for the 24th annual Brainerd Jaycees $150,000 Ice Fishing Extravaganza on Gull Lake in Nisswa, Minnesota this January 25, 2014. Join more than 10,000 anglers as they vie for fabulous prizes, including a truck, all-terrain vehicles, ice fishing equipment and so much more! Click here to see a list of all prizes up for grabs. Friday night, enjoy a Kick-Off Party at Grand View Lodge from 6:00 p.m. – 9:30 p.m. featuring liquor, beer and wine tasting, appetizers, a silent auction, raffles, games and music by DJ Walzy for only $35 per person! Saturday’s fishing contest will start at 12:00 p.m. and commence with an award ceremony at 3:00 p.m. on Hole-in-the-Day Bay. Click here to see who and what catch made last year’s leaderboard! If you’re thinking about dropping a line during this great event, check out our Ice Fishing Extravaganza package with accommodations starting at $180/night. Not only will you get deluxe lodging with breakfast daily, but you’ll also have access to FREE, PRIVATE shuttles to and from the Fishing Extravaganza event, along with admittance into the Grand View Lodge Guest-Only Hospitality tent where you warm up with some great food and beverages. Not only that, but guests will have access to the plethora of other amenities and activities currently available during the weekend. Click here to see a current schedule. The Extravaganza is a special one-of-a-kind event! Since 1990, this signature event of the Brainerd Jaycees generates more than $1-million in revenue for area businesses and more than $200,000 for over 45 Brainerd Lakes Area charities. Not only that, but the event is completely volunteer-ran and organized and has received national and international recognition in Sports Illustrated, National Geographic, ESPN The Magazine, and MSNBC just to name a few. If you’re interested in helping out the Brainerd Lakes Community and using your fishing skills to win some great prizes, drop us a line and reserve your lodging today. Limited space is available!